Lots of people I know don’t have pets because they’re afraid that a pet might destroy their belongings or otherwise cause destruction and mayhem. While this is definitely the case with some pets, there are steps you can take to mitigate the damage and take on a furry family member. The love that you receive from a cat or a dog in the house is unlike any other kind of love you’ll ever experience. It is an experience to cherish and hold dear, though I heartily admit pet ownership isn’t right for everyone. 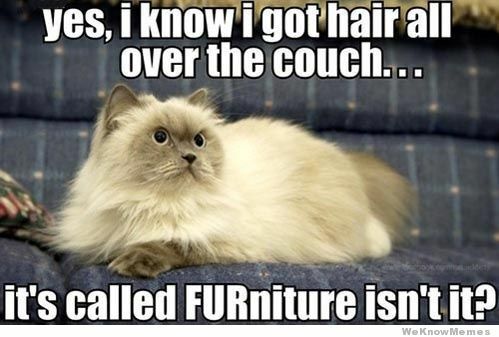 This one is tough to avoid at all costs, unless you decide on a hairless breed of cat or dog, but trust me; a house full of pets is a house full of loose fur! I have 3 dogs and 2 cats and I sweep and vacuum twice a week, which is probably less than half of what I should do. When you share your home with this many animals you learn to ignore the hair as much as possible. Some tips for tackling that hair problem? Soft leather furniture. I’ve had 2 cloth sofas and I now have a soft leather couch. By far, there is much less hair on the leather couch than on the previous sofas. You’ll have to mindful of claws and get high quality leather, but leather is much easier to clean than a cloth sofa. Regular grooming. The more hair you can remove with regular brushing and dog grooming means fewer hairs on your clothes! I groom weekly, but should do it more often. Use the hair as a condiment or garnish. My mother in law always said “Nothing tastes quite right without a Husky hair in it, or two!” I’m sure from an outsider this sounds gross, but fellow pet lovers can probably attest, there is no way you’re going to be completely hair free in your house. Keep nice things (handbags, shoes, baskets, electronics) out of reach and behind closed doors. Adopt an older pet who is less likely to damage your belongings. Be sure to find out from the shelter staff if there are any known “chewing” incidents. Create a pets-only room: A room where you pet can roam unsupervised with plenty of toys, beds and chews to occupy their minds while you’re away. Happy Holidays from our pack to yours! 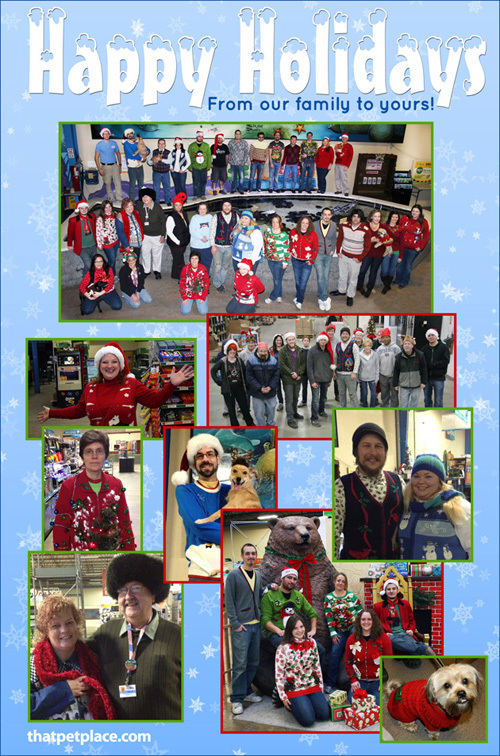 Here’s to a terrific 2014! Be safe, everypawdy! Nothing quite ruins the holiday spirit like a trip to the emergency vet… especially for something that could have been avoided. There are tons of plants that are poisonous to your pets that are available year-round (view the full list on the ASPCA website), but around the holidays many of these popular but poisonous plants seem to be in every home! 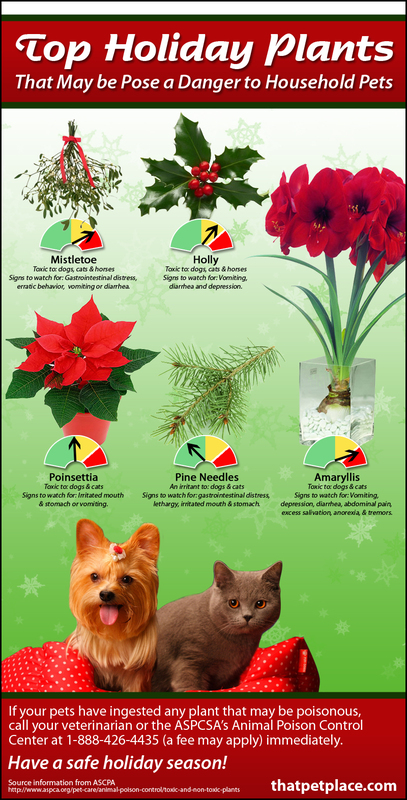 Do yourself, your vet, and your pet a favor and keep these poisonous holiday plants out of your home or safely out of reach of your pets! 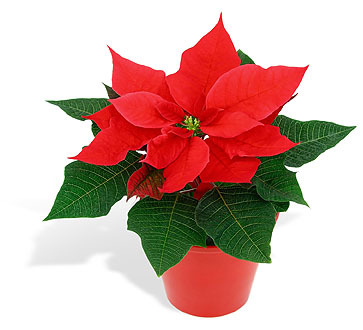 Many people know that poinsettias as toxic, however they are really only mildly toxic and aren’t too big of a concern for most pet owners, but better safe than sorry. To be on the safe side I always leave mine in the office instead of in my home. I really love this festive plant… But I love my furry family more. Signs to watch for: Irritated mouth and stomach or vomiting. Ah, to be kissed under the mistletoe… by my dog (hehe). If you have a spring of live mistletoe in your home, please keep it well out of reach of your pets. Along the same lines as the Poinsettia, this plant is now thought to be mildly toxic, but I like to play it safe. Signs to watch for: Gastrointestinal distress, cardiovascular collapse, dyspnea, bradycardia, erratic behavior, vomiting, diarrhea, or low blood pressure. Holly berries are very pretty, but they’re also attractive to dogs. This seasonal plant can cause symptoms that are similar to when a dog eats chocolate or caffeine. The bark, leaves, berries and seeds are all poisonous. Signs to watch for: Vomiting, diarrhea and depression/lethargy. Amaryllis plants are toxic to both dogs and cats. These bulbs are typically given as gifts this time of year. If you’re buying for a friend with a pet, pick a pet-friendly plant over this pretty bulb. Signs to watch for: Vomiting, depression, diarrhea, abdominal pain, excess salivation, anorexia, and tremors. While not exactly toxic to your pets, you will want to keep your pet from eating pine needles from the tree or the floor. Pine oils can irritate the mouth or stomach and if swallowed the needles themselves have the potential to puncture the lining of the stomach or intestines. Play it safe and sweep up those excess pine needles or put a barrier around the tree. Better yet, go for the old fake tree and save yourself the hassle of picking up needles for the next 6 months! Signs to watch for: gastrointestinal distress, lethargy, irritated mouth and stomach. Of course, if your pet has ingested any of these plants, please contact your local veterinarian, your emergency vet or the ASPCA Animal Poison Control Center at 888-426-4435. 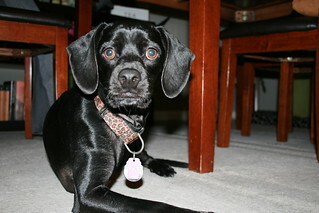 Today’s guest blogger is Barret, my wonderful, fun-loving, 3-legged best friend. In case you’re wondering, he’s an odd mix of Cocker Spaniel and Miniature Pinscher. Don’t laugh; I’m pretty sure that the items on this list are exactly what he’d ask for if he could! Without further ado, here is Barret’s 2013 christmas wish list for Santa Claus. Patchwork Pet Colossal Plush Toys: I just love to snuggle with toys that are the same size as me or larger. I drag them up to the couch, knead them with my front paw until it’s just at the right spot, and then ahhhhh… pure bliss. A big stocking full of RedBarn Filled Cow Hooves: These are my favorite treats… well out of the treats that Mom will let me have. Sometimes I eat them too fast though and get an upset belly, but it’s totally worth it. The filling in these smell and taste so good, my mouth is watering now! 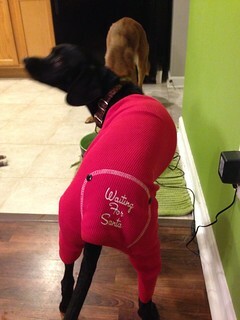 I really hate the cold, rain and snow, so a new Sherling Dog Coat would really help me out this winter. We’ve gotten that white stuff twice already! Yuck! It’s so cold I usually hide when it is time to go outside to potty. What’s great is the design of this coat will still work for me even though I only have 3 legs. 4. This leopard print Memory Foam mattress is right up my alley. I’m a bit of a Diva, so I really like animal prints, and this leopard print matches my collar exactly! Being a tripawd, it can sometimes be hard to navigate big fluffy pillows; one of these should be firm enough to keep me from getting tripped up, but still snuggly, soft and warm. 5. Speaking of animal print, this zebra print flexi leash is much cooler than the red one Mom has for me now. 7. You might not believe me, but I LOVE bath time! Really, I get very excited for a long, warm soak in bubbly water. My only complaint is that I come out smelling like a girl. This manly-smelling shampoo from Tropiclean is just what the masseuse needs to order. Christmas is just around the corner and it just wouldn’t be complete without some gifts under the tree for your favorite feline(s)! There are some great gifts for your cats to add to the list this year…read on to make this holiday a success for your precious pet with these great holiday suggestions! I don’t know about you, but two of the things I’m most thankful for everyday are my two faithful pups! They provide me with joy, companionship and unconditional love that I don’t know how I could survive without. They go everywhere with me and, of course, I tend to share everything with them, so the Holidays are a fun and busy time for all of us. Here are a few things to keep in mind this holiday season to be sure you can keep your pets involved, but also safe and happy through the most hectic time of the year! You know your pets better than anyone, but even though you love them no matter what, their adorable and often mystifying behaviors may sometimes make you ask “why do you do that”? 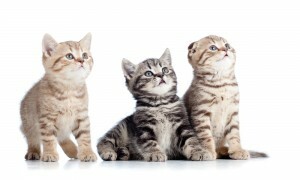 Here are some simple answers to common questions on cat behaviors you may witness every day. Why does my cat purr? Your cat’s purr may be one of your favorite things about hime or her. Where that distinctive sound originates is still debated, but cat owners know that unmistakeable trill, which begins when the cat is about a week old. Cats purr when they are content and happy, but also when they are stressed by fear or pain. The frequency of the purr has been linked to stimulated bone growth and healing, and it is also believed that endorphins are released while the sound is produced. So, despite the obvious communicative properties of a good healthy purr, it may actually be contributing to your pet’s overall well-being, as a self-soothing, self-healing, relaxing therapy. You probably already know that a purring cat can have similarly soothing, healing, relaxing powers on you too! Why does my cat knead me with his paws? 1 in every 4 dogs and 1 in every 5 cats will develop cancer in their lifetimes. That is a sobering number of pets diagnosed each year. November is National Pet Cancer Awareness Month, and as a pet parent of a dog who has beat cancer, I’m here to tell you that cancer isn’t a death sentence. Medical advancements and a better understanding of how cancer works has led to a dramatic increase in the lifespan of both people and pets diagnosed with cancer. 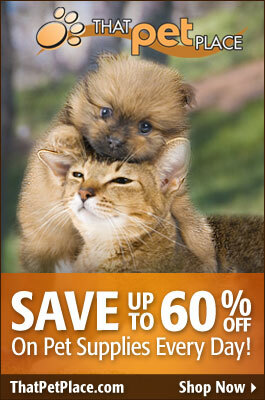 First, let me tell you that I know how devastating it can be to receive a cancer diagnosis for your beloved pet. I’ve been there. If you’re facing a recent diagnosis, start your research and healing process here. Kittens are cute. It is an undeniable fact that the little balls of soft fur that are clumsy in their own kittenish way are probably one of the cutest animals on the planet. When you bring the kitten home, you may be thinking that there is nothing to know about raising cats as they are often portrayed as being pretty self-reliant. Cats, however, do talk to you and you should have an understanding of what they are trying to say. These communications are not always going to be verbal displays, they will also include the animals’ mannerisms, or how it presents itself. You may be tempted to try disciplining your kitten in order to break it of any bad habits that may be present. Some suggest making a loud noise by either clapping or banging something, while others suggest using a spray bottle to stop undesirable behaviors. Whichever method you choose you will want to be sure that you never shake, yell at, or kick the kitten. Kittens, much like human babies, are incredibly delicate. Shaking, hitting, or kicking the kitten can cause serious problems. You will also want to be careful to avoid doing things that cause your kitten to become skittish or afraid of you. 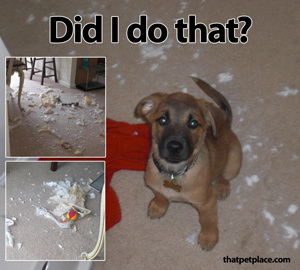 As pet owners, we like to think we have our animals well-trained. My dog uses the doggie door without a problem, and the cat comes on cue. But if I had a nickel for every time someone jokingly said that the animals have me trained, I would be exceedingly wealthy. That is one of the most common phrases that pet owners use amongst each other, and for good reason. Here are just some of the ways that your pet may be training you.